Remember those Archie’s Galleries back in India? Valentine’s Day always stir up very special memories for me… all those times of courtship, of holding hands and spending hours browsing “Love” cards in the gallery along with other Love smitten college kids before the Valentine’s day. As silly as it sounds, it still puts a smile in our hearts:-) Yes I was 18 then… many eons ago, a part of that crowd in Archies as the Love Bug had bitten me too. Over the years the Archies cards have made ways to short sweet handwritten notes and little appreciations for one another. Many seasons have passed ( no we are not bald & old yet) – the aura & warmth of those intense flaming times still remains strong between both of us. I would say, given a lot of time thru’ the day we would make everyday our Valentine Day. When I saw this in Scott’s Blog (Real Epicurean), I knew I had to make these for my sweetheart. I loved the idea of using a dry fruit to coat with chocolate & using a nut with it-A Perfect Balance of Taste & I knew he would love it. Here it goes to Alka’s (of Sindhi Rasoi), JUST FOR YOU!! I have not done a perfect job in my craftsmansip like Scott did. You can see the uneven & the chipped off part of the chocolate in the picture, but they still tasted delicious:-). It is also done a little differently than the recipe I followed. I used Spiced Rum, added Nutella (to fill in all the nook & crevices with chocolate), & also an extra layer of white chocolate with the crunch of the cookies. These Plums in Chocolates were off limits for kids, since I used Rum in them. These are going to the World Nutella Day 2009 declared by Sara from Ms. Adventures in Italy and Michelle from Bleeding Espresso (and Shelley from At Home in Rome, in spirit), hosted here. Coming back to the Sliwki W Czekoladzie…. Soak the pitted Prunes in the Rum, if possible overnight. Lightly toast the Nuts ( I popped them in the microwave for about half a minute). Take the prunes out of the rum, pat them dry on the outside with a paper towel. Push one nut inside the prunes (where the stone is supposed to be). Set aside. Start boiling some water, & in a heat proof bowl, melt the white chocolate over simmering water( I melted the Hershey Cookies N Creme). During this time take some Nutella in a bowl. Insert a toothpick in each nut stuffed prune and roll them in the nutella, so it gets a rough coating. I had to use the back of a spoon to evenly coat the Nutella on the prunes. Finish doing this to each prune and set them aside on parchment paper or a platic wrap. Once the Chocolate has melted (It should not be runny, but thick enough to coat a spoon), take each prune and coat the prunes with the white chocolate. (Since I had used the Cookies N Creme, It formed a rough layer on the prunes… a bit bumpy becoz of the cookie chunks in the chocolate). Place the chocolate coated prunes on a plastic wrap or pachement paper and chill them in the refrigerator till the chocolate becomes firm. Melt the other chocolate in the same way as you did the white chocolate. 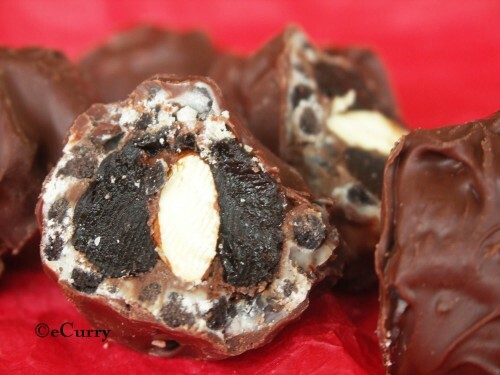 Take the prunes out from the refrigerator and coat them with this regular chocolate. Take the toothpick out from the prunes. Use another toothpick or the finer edge of a spoon to push out the prunes from the toothpicks. Refrigerate the chocolate coated prunes again till the chocolate is firm & chilled. These were just absolutely delicious. Since I used the Cookies N Creme White Chocolate, the layer of the white chocolate added an extra layer of crunch. The Nutella always adds delightful flavor. Me & my hubby just loved this. So here it goes to The Alchemist Chef for the Valentine’s Day Recipe . & also to hosted at Mele Cotte. And yeah i still thrive on those wonderful archies gallery days memories ,and keep wondering why those lovely things are for teenagers,why no such mushy and romantic things for so called grown up,sensible ,now-practical ,married couples? Dried fruit, nuts and chocolate is such a winning combination. I’m sure your ‘love’ loved it. Teenage memories do bring a smile in our face, regardless how old we become. oooohh, those look so delicious Soma! I love the layering of different chocolate flavors on them. Can I come over ? And the photos look really tempting. They looks so yummy yummy delicious. Yeah the archie gallery, i used to buy cards from there when i was 18 for hubby ( that time not hubby we were courting then) and always used to wait for the post to arrive with his card. Your pictures are getting so pretty these days….always better than before!! I love the way you have set them in the red background. The nut, the chocolate and all those layers – looks very appealing!! This one is extremely delicious Soma, I love fruit, nuts and may be i can substitu with dark one (which I love). They re gorgeous! I agree with Sunshinemom. your pics are getting really pretty day by day 🙂 i am ready to have anything made of chocolate anytime. They look delicious and your description of the cooking method is much better than mine! Well done! Khub sundor dekte lagche and such a cute post. Mmmm.. those have to be insanely delicious! Layered chocolates are lovely because you never know what surprise awaits you in the next layer. I love your two chocolate, fruit, nut version. 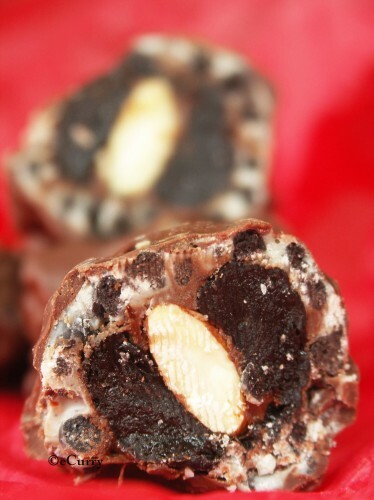 Chocolate covered prunes with nuts do sound amazing! 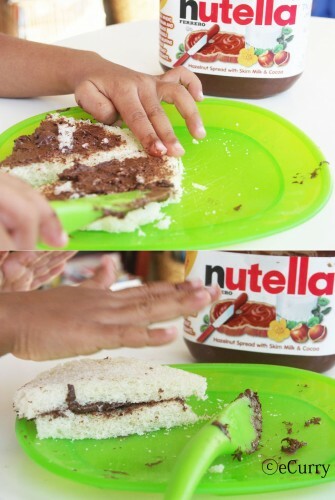 Wow looks divine.I love Nutella….yummy.First time to ur blog,u have a nice blog out here. I even knew a girl who used to collect cards in advance to give whoever she married eventually! She had more than a boxful of them. But cards are a nice thing – thanks to e-mail, I barely even go to that section of the store now! Gorgeous, marvellous, tremendous watelse to say?? am speechless n just drooling over them.. Your post make me remind the good old college days…….Hmmmmm nuts and chocolate make really wonderful combo. Ooooh, look at that beauty! I just wanna reach out and grab a bite! I wonder if it will look that good if I make it myself 🙂 If you have time do drop by Foodista.com Would also love a link to this beauty from our site. Here’s how you can create inbound links from our site: Check it out here. Thanks! This looks irresistible. Great entry for KOL. Thanks! 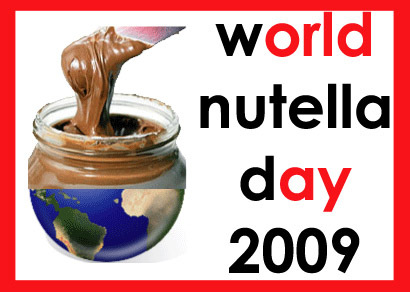 Soma, I didn’t know there was a World Nutella Day, and I’ll be darned if I can pronounce this recipe name. But I’ll surely say it looks delicious and worth every bite. I still visit Archies and send cards to my best friends and give them to my husband – nothing can replace a card I feel. Thanks for evoking those fond memories…that is one delicious recipe – am sure your loved one will enjoy it. This really looks lovely. Good treats, now that Valentine’s day is coming! Just lovely !! great recipe and awesome photography !! The 2 pair of hands in those photos must be your 2 angels. right? of course like your web site but you need to check the spelling on several of your posts. A number of them are rife with spelling issues and I in finding it very troublesome to inform the reality however I will definitely come again again.